or How’s this for a load of pseudo sanctimonious drivel? The following notice appeared on the back page of last Sunday’s church bulletin. It is full of mistakes and misinformation. The Church Mouse has added a few clarifications and corrections. Come to the 6 pm Mass next Sunday, the Solemnity of All Saints, with our very own(1) Archbishop Anthony Fisher, OP to consecrate our new altar. It will be once in a life time celebration. Bring food and drink to share after the event. No regular Masses next weekend. Here is the text of Fr Frank Brennan’s homily for Ted Kennedy’s tenth anniversary mass. See photos of today’s wonderful celebration in the Photo Gallery album Ted Kennedy > Tenth Anniversary . A mass will be held at St Vincent’s, Redfern, at 10am on Sunday, 24 May 2015, to commemorate the 10th anniversary of the passing of Fr Ted Kennedy. The parish priest, Melvin Llabanes, has kindly agreed to have Fr Frank Brennan concelebrate and deliver the homily. Morning tea will be served after mass – please bring a plate if you can. The following is a condensed version of an article written by Val Noone on the occasion of Ted’s funeral, and published in Táin Edition 37. The new Archbishop of Sydney – a man with a big appetite for justice – see letter to St Vincent’s from 2005. Have the intervening years had any mellowing effect? After many months of delays, and only(?) about a year after Cardinal Pell instructed the parish priest that the mural was to be restored, today the restorer finally was allowed to begin work. It should take some 4-6 weeks, working Mondays to Thursdays, and fitting in around morning Masses and Sharing the Meal. 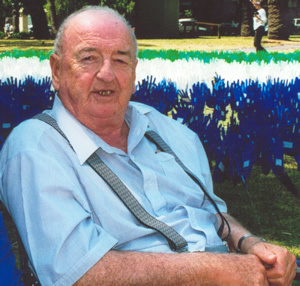 On Monday 11 August 2014 at St Vincent’s Redfern we farewelled Tom with a wonderful celebration of his life. Details will be posted soon. In the mean time, you are invited to email your memories of Tom to Peter Kearney for collation into a tributes booklet to be given to Tom’s wife Jan, and daughters Alexis and Kimberley. Tributes will also to be shared with the wider Redfern community through the Church Mouse website. The Mural saved – ? Parishioners have been asking the parish priest for a clear statement of his position on the Aboriginal Mural since rumours of its impending removal began to circulate. On one occasion, when particularly pressed, he reluctantly said he would not remove the Mural, but added, sotto voce, that someone else might.